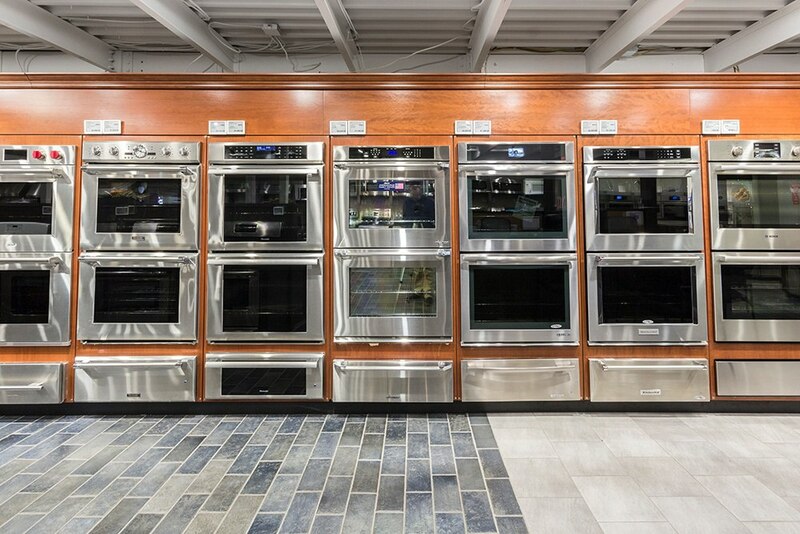 You are researching wall ovens and have an abundance of options. There are over 40 wall ovens on display at Yale including the ones in our working kitchens. In this article, you will learn about the basics of smart technology and then the best wall ovens to consider at all price levels. Which Wall Oven Should I Buy? Following are the ovens with incredibly good functionality. For instance, when cooking a prime rib in the Wolf M series' gourmet program, it will tell you where to insert the meat probe and what rack to cook on with no preheat required. The oven will incorporate rest time and also inform you when the roast is done. Miele’s MasterChef technology offers over 100 programs, and its MasterChef plus program has a fully functional option to choose from to create 15 different types of bread. 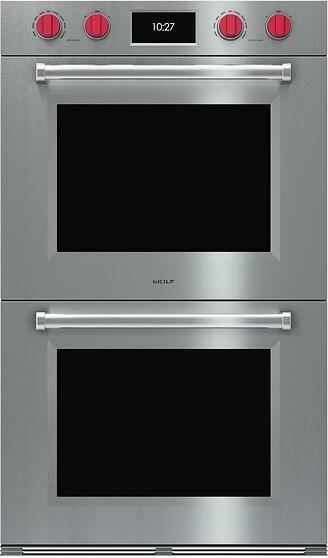 Unlike most ovens, Miele is simple to operate as well. We will look at the five best currently offered. The M series offers three distinctive styles, professional, contemporary, and transitional, however, all of them offer the same features. (This model has the option to have a stainless door). The rear oven is arched for more usable space and has two corner column fans with vertical heating elements that provide a perfect heat flow. The Gourmet Feature offers a menu of almost 50 preset controls that automatically control the cooking. 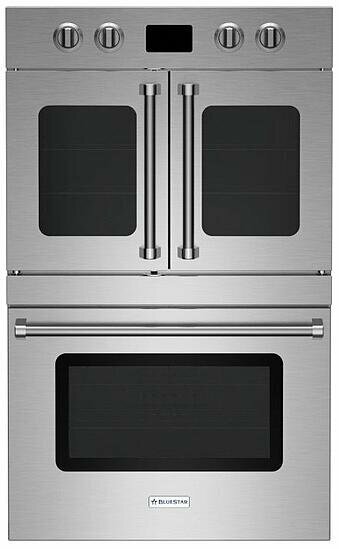 The M series ovens not only offer a variety of looks to match any style kitchen but also makes cooking easy and fun. Their Gourmet setting is foolproof from prime rib to lasagna to apple pie. It will walk you through each step even telling you what rack to place the food on for best results. The arch in the rear of the oven allows more oven capacity for larger roasts or accommodating multiple dishes at the same time. Wolf has made the largest strides in advanced convection technology by implementing corner column blowers. The blowers are more powerful than fans and with more even heat, top to bottom and side-to-side while maximizing usable space in your oven. 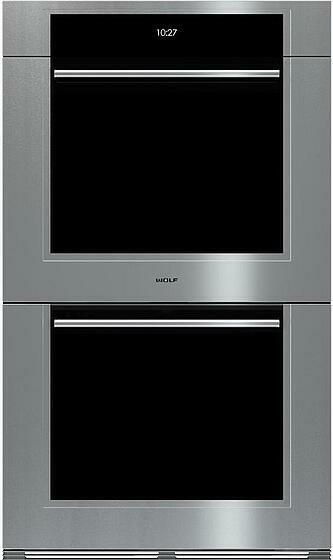 Miele has a very distinctive look it's clean and modern and extremely dependable. Miele is an engineered and manufactured in the same factory creating an amazing quality control. Their MasterChef is like the Wolf Gourmet; however, it has a significantly larger library of recipes and extensive bread baking options. The steam assist (moisture plus) is fantastic for creating moister roasts and helping vegetables retain their texture and creating a crispy crust and soft interior on bread. BlueStar does not make a wall double oven. However, you can customize a wall oven with one electric and one gas oven. 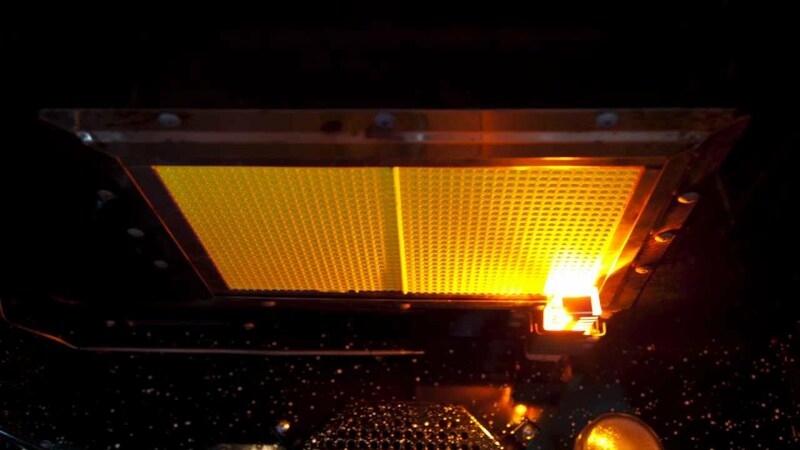 People gravitate to electric most times, but gas is a moist heat for better roasting and their infrared broiler is the hottest and the best to sear. A gas oven which is better for people who prefer to cook rather than bake. BlueStar ovens are great for the chefs who love to bake in the electric oven with its wide commercial size opening or who love roast meats in the gas oven. The gas heat has more moisture than electric and the infrared broiler on the gas oven is great for searing and broiling at 1850 degrees. French doors are convenient as well because you do not have to lift a heavy turkey over an oven door. The BlueStar ovens are extremely customizable with 750 colors. The disadvantage is basic controls with no interactive functionality. This oven is tailored for the experienced home chef with a preference for roasting. Ok, now for something different. 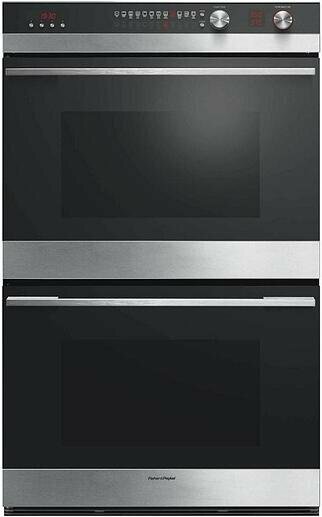 Fisher & Paykel looks different with contemporary styling. It also has 11 different cooking modes with specialty baking, broiling and pastry options. 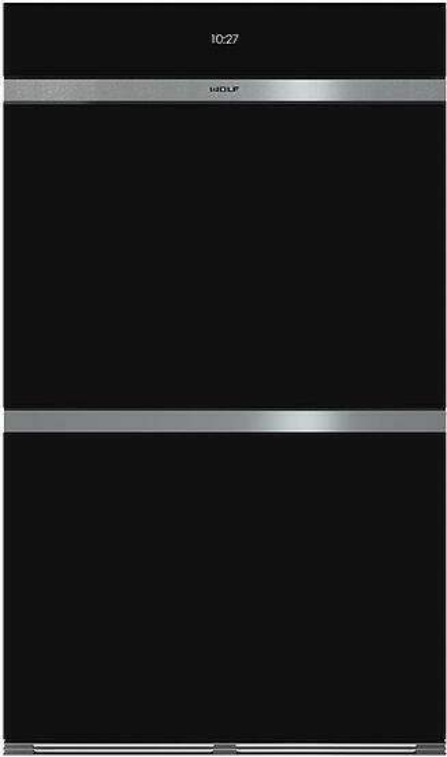 Fisher & Paykel has other complementary products in cooktops and refrigeration to complete an unique look in your kitchen. The Bosch has decent functionality with a meat probe, convection and a number of different cooking modes. 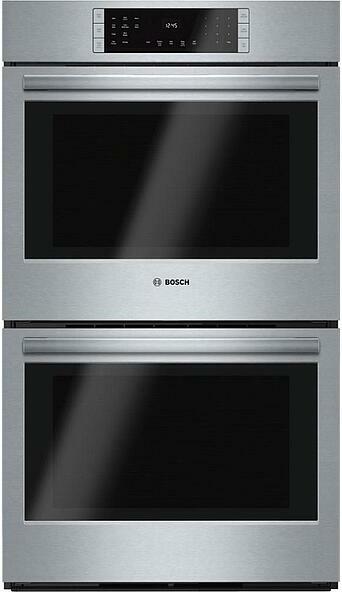 Bosch is clean looking and you can combine this oven for 10% off throughout the year. Smart ovens take the guesswork out of cooking, giving you programs that tell you what to do, from start to finish. A few years ago, smart ovens just calculated time and temperature based on your food type. You would simply input what you were cooking, the level of doneness, and the oven would figures out the rest for you. In 2018, wall oven Wi-Fi connectivity was available on from brands like Jenn-Air, Samsung, and Dacor. Presently, you can control these ovens remotely from an app on your phone but with limited functionality. Jenn-Air is probably the most advanced allowing you to set basic functions and check your timer as well as oven temperature. Jenn-Air is the also the first Alexa-enabled wall oven. Jenn-Air’s vision in connection with Amazon’s Home Connectivity is for you to one day press lasagna on your oven, the oven will scan the refrigerator for the ingredients to alert you what you still need, and then pre-program the correct cycle on your dishwasher. 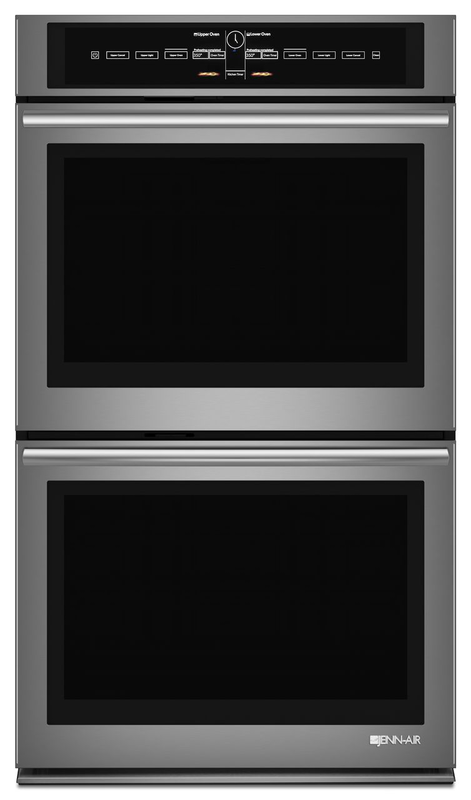 A full-color LCD display allows you to touch anywhere on the screen and select your oven options. The display intuitively presents information to make it easy to get the most out of all of the oven's functions. Jenn-Air is simpler to operate. Like Wolf’s and Miele’s wall ovens, you can scroll through automatic cooking programs, but Jenn-Air is the only one to show you pictures of the finished product. 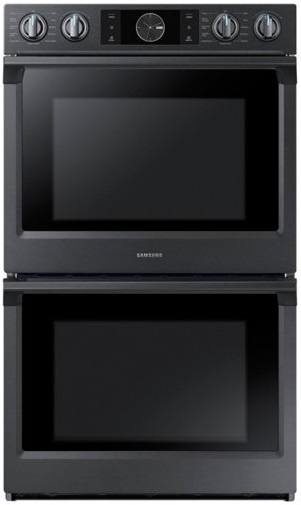 Samsung has entered the wall oven market in less than 2 years of acquiring Dacor. It has Flex Duo compartments allowing you to cook two separate items at different temperatures in the same oven. The interface is beautiful, and at $3,599, the unit is affordable. You also have steam assist capabilities in the Samsung along with a beautiful, robust control panel. Should You Buy a Smart Wall Oven? Smart technology is the future of appliances without question. Presently, the Apps are slow when they work, and the functionality is limited. Then there are compatibility issues. It is our recommendation to buy on other features, not just for smart technology...yet. 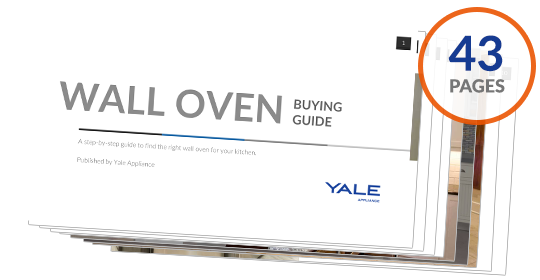 Get the Yale Wall Oven Buying Guide with features, specs, and inside tips to all the brands. Well over 410,000 people have read a Yale Guide.